How Much Energy Does Freeze-Drying Use? Freeze drying four trays of food in a Harvest Right freeze dryer takes between 24 and 36 hours. You can freeze dry about 6-10 pounds of fresh food in each batch. One of the great benefits of freeze drying is that it can save you money by allowing you to buy food in bulk and preserve your own garden harvest while reducing food waste. So, how much does it cost to run a freeze dryer for a day? We care a lot about the answer to this question! We want to help our customers be good stewards of their finances, and of the Earth! For that reason we engineer our freeze dryers to run as efficiently as possible. Our freeze dryers use a standard 110 volt outlet, so running the freeze dryer costs about $1.00-$2.80 a day, depending on power costs in your area. 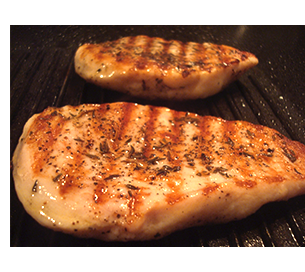 Here’s an example: The average price of chicken breast nationally is $3.14 a pound. If you were to grill or bake 10 pounds of that chili lime chicken breast we’re always talking about, then freeze dry it and preserve it in Mylar bags with an oxygen absorber, you’d have an investment of about $35 – for 10 pounds of chicken! That’s 40 servings of a delicious, versatile protein source can last up to 25 years. Given how little it costs to operate, you can keep it running day after day (and many of our users do!) while barely impacting all of the money you save by creating your own food storage, taking advantage of supermarket sales, better using your garden produce, and reducing your overall food waste. Also to the point, how much does your refrigerator/freezer cost. Even if you buy frozen in bulk, you will burn electricity keeping it frozen and lose energy each time you open the door. If I have extra food, I cook all of it that needs it, then run it through the Harvest Right, and won’t need another watt to keep it fresh for the next 25 years. I don’t need to have anything spoil. I remember reading articles in sizing your generator or what to do so that your chest freezer won’t get above freezing. Other than maybe ice-cubes or prepping something to freeze dry, I don’t use my freezer. I should also add that most of the time I’m not doing the 25 year thing so don’t need the special bags or oxygen absorbers. To eat healthy, I like to have eggs, yogurt, cottage cheese, and lunchmeats – roast beef, turkey, chicken and the like around – the latter is a good substitute for chips, the former for “puffs”. I don’t have to keep any of it in the refrigerator, but use airtight resealable containers – they also work for the few months over winter where I’m enjoying the local farm fresh vegetables. I’m not sure I can eliminate the refrigerator completely, but I think I might be able to replace the normal sized one with a much smaller model that uses less electricity. How much refrigerator do you need (I won’t go into what the winter weather is like here) – but it is one thing to think of the freeze dryer for long term prepping storage, and another when it is part of “everyday” preservation. Admit it – you probably have a number of things in your refrigerator or freezer right now that should be discarded. I’m Considering most home builders only install one 240v(a.k.a. 220v) outlet which is typically for the cloths dryer and the cost to install another dedicated 240v receptacle may have been factored into the cost of running a 240v freeze dryer vs a 120V unit. Electrically speaking devices using both phases of power coming from the electric utilities transformer is a much more efficient use of power and as such requires less overall consumption. A 240v motor actually runs smoother than 120v motor so requires less total watts to do the same job. If you have a model that runs on 240v, please advertise it. I would be more interested in that option. Thanks for your comments. We have gone back and fixed that. 10 pounds of chicken feeds 40 people? That’s based on the USDA serving size information that says 4 oz of chicken equals one serving. But, you’re correct, a serving size doesn’t necessarily mean that’s what people will want to eat. my interest is using this product for mostly fruits, and or vegetables, however you will not really know how effective this process is until you actually use your freeze dryer machine. I have over 30 dwarf fruit trees, and I am not sure if all the varieties will taste similar as to the canning process, and or dehydrator process as snakes. I will say that your freeze dryer is a great invocation for residential use, if it surpasses the user protocol. thank you, and you have a very nice, informative personal answering all the consumer questions which is a positive reflection of your product. I don’t know exactly how much it costs to run. I ran mine hard when I first got it last summer and did notice a spike in my electric bill. However now that my food is done, it doesn’t cost anything to keep. Canning spikes my propane bill and glass jars weigh more and I don’t think canned goods will last as long as freeze dried. And the meat still in my freezer costs me electric everyday to keep it frozen. Bottom line is, the Harvest Right freeze dryer will pay for itself over time. But how do you put a price on food that is light weight, keeps for 25 years, and tastes good when you rehydrate it. (the survival food people put a price on it and it’s expensive) We put up our extra eggs, goat milk, garden and orchard produce. Also we did chicken & beef, both raw and cooked. I love my Harvest Right and recommend it to anyone interested in storing their own food. Why don’t you people say in normal terms of watts and ampers? All this “less than $2.17 per day” is meaningless. I would like to have freeze dryer installed in an off-the-grid house, but I can’t figure out the power requirements. I understand that now we have an era of ignorant housevives, but not everybody outh there is that much hopeless, and some people prefer to get a direct, no-nonsense TECHNICAL info. So please, just give us proper data will ya? average of 8 amps, which ends up being roughly 900 watts or 18-20 kilowatt hrs per day. Thanks for your question. Super info. What size unit is the amperage for. I gather it is one running at 110v, not 240 given the amps and the power consumed. As well, since both the cooler and the vacuum pump are using motors, is the startup draw available — if I end up off grid that can be important. Many thanks. Rude much? I’m pretty sure all you had to do was ask in a straight forward, non-condescending manner and your question would have been answered. To be fair, you are probably one of the few that wants the info in that specific a manner. I will say that I do appreciate having the info that you asked about. Just the way you asked was not necessary. If these are as good as you say then they sound like an amazing appliance. But that’s a lot of money to invest in something I’ve never tried and no one around me has one to see it or try the food.. Do you have a free trial period where I could try for a 30 or so days and return if I don’t like it? In Arizona where I live the kilowatt hour charge is 14 cents. My cost would be $3.00 to run the freeze dryer for 24 hours. It does not matter if the freeze dryer runs off of 120volt AC or 240volt AC, the cost would be the same. An 8amp current draw on a 120 volt AC power receptacle is not normally a problem since most home outlets are 15 amp (including the breaker). Only in very old homes, built back in the 1930’s (having no ground wire) would it be a possible problem. At only 8 amps draw this freeze dryer SHOULD NOT be configured to run off of a 240 volt receptacle, that would be a bad idea. Hello. I am off grid and was wondering on how well the machine would take to being turned off and on during it’s cycle. I run my house off of a generator (Honda 3000is) and I run it at night for my Mom’s oxygen concentrator and during the day I switch the house to batteries and inverter. During the switch I unplug the house from the gen and plug it into the inverter. And I was wondering if that would mess up the settings on the machine. I have a battery system of 6 six volt batteries and was thinking if I made a dedicated system of the same I might be able to run your dryer but only if it can take short term shut offs and not have it ruin the food that is in it. Those are great questions. The freeze dryer is designed to start right where it left off. The best example in your instance is a power outage. Suppose you were in the dry cycle during a power outage. The freeze dryer would recognize this and when the power turns back on, your freeze dryer will proceed in the dry cycle right where it left off. Sure. The trays are 7.5″ x 18″. In general, you can freeze dry 7-10 lbs. of food at a time. DETAILS, DETAILS, DETAILS! Do you pre-freeze your trays of food before puting them in the machine? What freeze times do you use for the various foods? What freeze temperatures do you go to before changing to the drying cycle? What times for drying do you use for various foods? What causes the vacuum hose to accumulate oil in it? What vacuum mTor do you expect the machine to achieve while drying? Can you over-dry foods? Do you have to blanch vegetables before freeze drying? Do you dip bananas and apples in lemon water before processing? DETAILS, DETAILS, DETAILS! We pre-freeze our food, but it’s not required. We almost always use the default times (9 hours freeze and 7 hours dry) on our freeze dryer for most foods. The one exception we try to follow is that if foods have a high sugar content (e.g., pineapple, ice cream, really ripe peaches, etc.) or a membrane around them (e.g., blueberries, pomegranates) and are harder to freeze then we like to not only pre-freeze them, but we also increase our time on our freeze dryer to 12 hours freeze time and 12 hours dry time. Then, when the cycle is done, we always check to see if the foods need more dry time. Most of the time, we don’t need more dry time. If we do, we just add the default extra dry time of 2 hours. You cannot over-dry your foods, so it’s fine if you end up drying more than you need. Generally most foods are dry if the mTor gets below 300. You do not need to blanch your vegetables before freeze drying, except potatoes because if they are freeze dried raw, then when you go to rehydrate them they can oxidize and turn black. We do like to dip our apples in lemon water to prevent browning, but they don’t need them. We dip them in lemon water and put them on the trays and put them in the freezer while we finish up our other trays. We don’t seem to need to do this with our bananas. If you work quickly enough and put the trays of bananas in the freezer as you go then we don’t seem to have issues with browning. We do have them. You just need to call our offices at 1-800-700-5508. Just saw this post and don’t know if you ever received an answer about your F vs. C temp question, but -40 degrees is the same on both the Fahrenheit and centigrade scale! Freeze cycle: 320 Watts or 0.320Kilowatts 9 hour freeze cycle @ 320 watts @ 8.1 cents = 24cents. I hope this helps, please comment or email me if you have observed differently, we just got the unit a couple weeks ago, all this is an educated guess at this point, because my KWH meter outside shows higher than this, but too many variables until more freeze dryer and utility bill cycles are complete. Our farm is on solar power. Generally direct solar by day and battery-bank at night. I am looking for the amps this unit consumes, as I am concerned about draining our battery-bank at night. On the average, the freeze dryers run at 9 amps. A customer of ours who is an Electrical Engineer put together a very good analysis for the different foods he freeze dries. It ends up costing about the same as extra refrigerator or using a dehydrator. Check out this website to learn more: https://www.familycanning.com/freeze-drying/cost-analysis/pork-chops/. Considering the cost of purchasing freeze dried food, you should be able to make up your investment rather quickly. Most of our customers see a good ROI after about 6 months. I have the large freeze dryer and the dry scroll pump. Would anyone happen to know the energy consumption, on average, for that combination? I can’t seem to find any data on it, probably because it’s fairly new. At peak, the large freeze dryer draws about 16 amps, but on the average about 10 amps (1500 watts) of power per hour. I live off grid with a small battery bank and modest inverter so have a few unique questions. I can’t run the Harvest Right small unit unless I have enough sun for PV power, so would have to freeze in my propane freezer in advance, and am limited to say 6 hours of drying time. Is that viable for thinly sliced or cubed vegetables and greens? What is the peak and average current draw for drying? I’m impressed that Harvest Right consistently gets great reviews on customer support! I would like to know what the difference in power consumption is between the “small” and the “large”. I figure if they run about the same for power, than it would be more efficient and cost effective to get the “large”. You are right, the Large and Medium are more economical for power consumption.